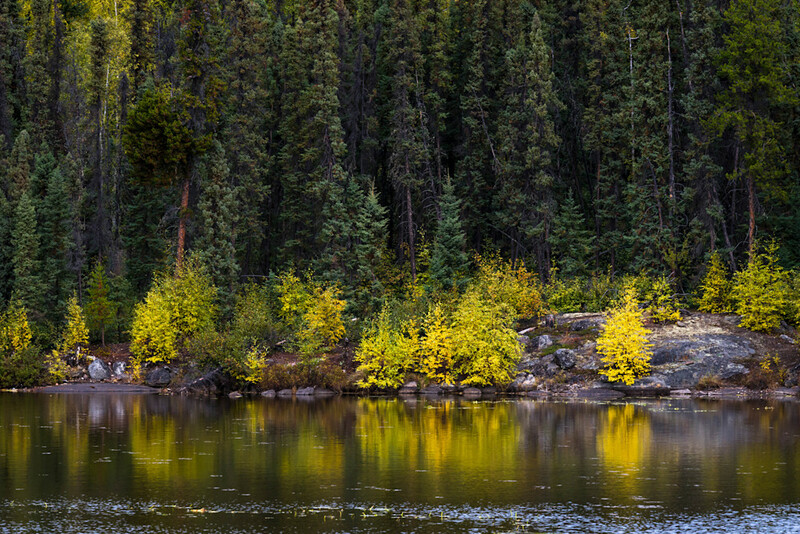 The Ingraham Trail is a popular recreation highway leading to a vast network of lakes, rivers, waterfalls and boat launches popular for adventure and recreation. This is one of the serene lakes just off the trail. According to wikipedia,Yellowknife is on the Canadian Shield, which was scoured down to rock during the last ice age.The surrounding landscape is very rocky and slightly rolling, with many small lakes in addition to the larger Great Slave Lake.Trees such as spruce and birch are abundant in the area, as are smaller bushes, but there are also many areas of relatively bare rock with lichen.Yellowknife's high latitude causes a large variation between day and night. Daylight hours range from five hours of daylight in December to twenty hours in June. Twilight lasts all night from late May to mid-July.